Virtually all species of wild animals are acceptable as a food resource to some group of people in Africa. Species which may be tabooed by one group of people are a delicacy to another group elsewhere. Species eaten vary from antelopes to monkeys, rodents. reptiles and a whole range of invertebrate species including snails, termites and beetles. Jardin (1970) lists hundreds of species belonging to 236 genera reported to be eaten by people in Africa. Bushmeat is eaten as fresh meat, smoked, salted or sun dried (biltong). Smoking is the most widespread form of preservation and smoked bushmeat is available in urban markets in most African countries. The range of species taken and relative importance of the different species have been documented for several areas of the continent and vary from locality to locality depending mainly on the species available for exploitation in each region and also on hunting restrictions enforced in each county. Rodents are particularly important in terms of range of species and numbers taken in many parts of Africa, possibly because they are not subject to hunting restrictions in many countries and also the fact that their high reproductive capacity makes them relatively more abundant. A comparison of the use of mammalian species in relation to species occurrence in different environments and the subsistence base of the people living in those environments showed that hunter-gatherer communities living in forest environments used a wider range of the species available to them, while pastoralist communities living in dry environments used only a limited number of species (Table 2.3). Lahm ( 1993) recorded 254 species of wild animals harvested by hunters and trappers in three villages in north-eastern Gabon. Ungulates accounted for 57.5% of the catch with the blue duiker Cephalophus monticola being the most common species taken. Primates formed the second most important prey group; Cercopithecus nictitans was the most frequently harvested species. Of the rodents, the brush-tailed porcupine Atherurus africanus was the most common species taken, being second in numerical importance of all the species harvested (Table 2.6). The differences in the numerical abundance of the species harvested was attributed to the relative abundance of the different species in the locality, their accessibility as well as factors such as dietary taboos, small size, cryptic behaviour and activity patterns. Species such as monitor lizards (Varanus sp. ), frogs and toads, turtles and tortoises and several species of snakes, including venomous ones such as the Puff-adder (Bitts sp.) are regarded as delicacies among many African communities in southern Africa, while caterpillars and a number of moth species are relished in rural communities (Maliehe, 1993). The range of species harvested is particularly diverse in West Africa, including a wide range of rodents and other small mammals and invertebrate species, perhaps due to the scarcity of larger mammals. African giant snails (Achatina sp. and Archachatina sp.) are popular among both urban and rural dwellers in West Africa (Ajayi, 1971; Anadu, 1987; Afolayan & Ajayi, 1983; Osemeobo, 1992). Snails are most abundant in the forest areas of the region during the rainy season when they are heavily exploited for food. Despite the seemingly wide range of wild animal species exploited for food within the region, people have clear preferences. 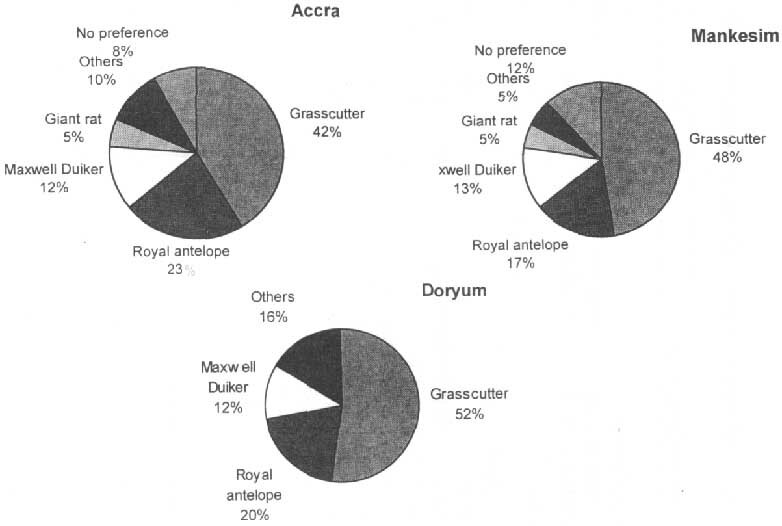 The grasscutter is undoubtedly the most important bushmeat species throughout West Africa in terms of volume of trade and preference (Fig 3 and Tables 3.6-3.8). In a survey of meat preferences in Ghana 40-50% of the people interviewed in various towns considered the grasscutter to be the most favourite species and 76% of people eating bushmeat in chop bars in Accra selected grasscutter meat. The grasscutter was followed by the royal antelope Neotragus pygmaeus. In contrast, large rodents other than the brush-tailed porcupine are less important dietary items in Gabon and other areas within the central African sub-region where significant large mammal populations still exist.